At the request of Faye Feng, I spoke at Turner-Fenton Secondary School in Brampton at an event sponsored by the PSPC. This event was for hundreds of student leaders in grades 9 -12 from across the Region of Peel. They donated $500.00 for The Creation of Hope. In the coming months we will list where this money was spent. As noted in the last update once again the students of Prince Philip, under the leadership of Ryan Rumsby are raising money, by raking leaves and other fund raisers. They raised $550.00. In addition we already had $150.00 that they had previously raised. As well as raising the money Mr. Rumsby has also allowed the students to decide how the money will be spent. He broke them into groups and let them debate, and then present options. Here’s a note from Mr. Rumsby. Once again, I’m so proud of these kids! You should have seen the discussion we had around all of this. I wish I had video taped it. After much heated debate, we’ve decided on the following two things. We’d like the money to go towards on-going medical expenses that may come up for the children. We’d also like to help Mutuku out with his tuition. The class was figuring on $350 being allocated for medical and the rest to Mutuku. The class was really big on the idea of a short term plan (medical) and a long range plan (educating Mutuku so he can help others in the village into the future). 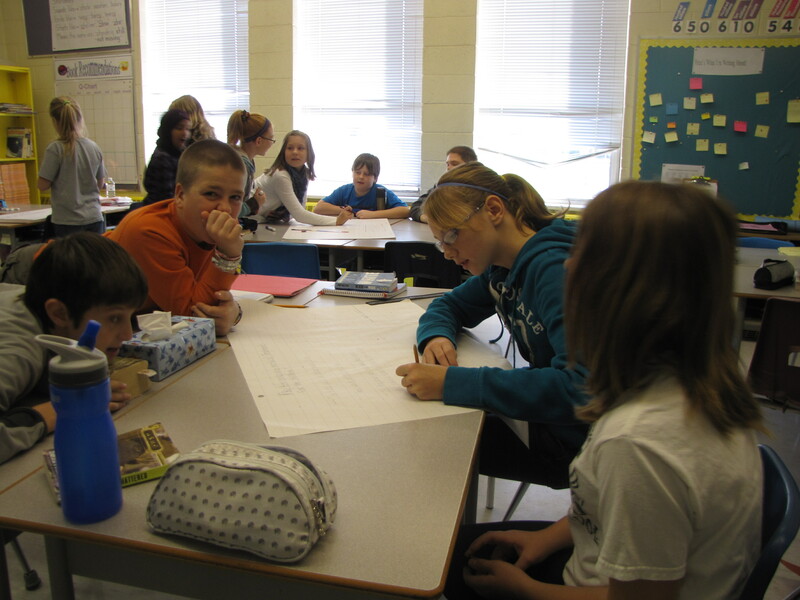 Mr. Rumsby’s class making the decisions. 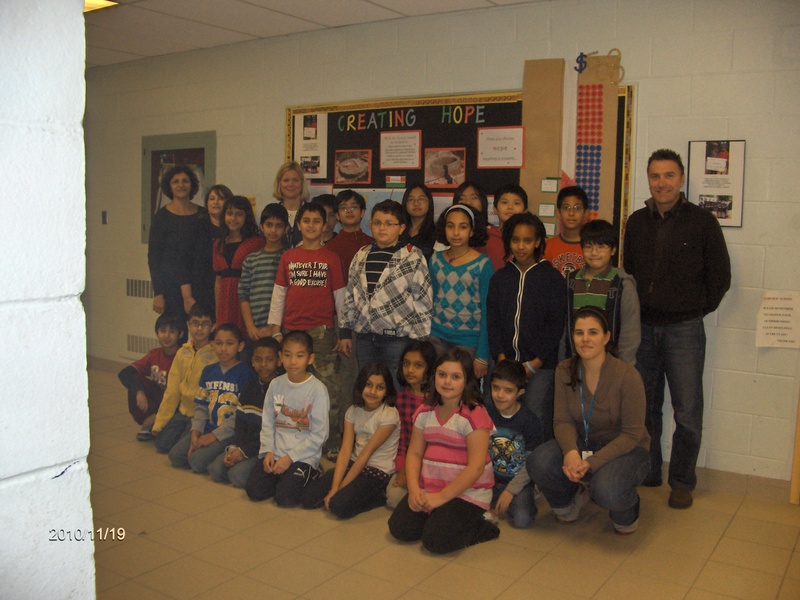 Fairview P.S., under the direction of a team of teacher has raised $1242.94. Here’s a note from the Fairview newsletter. Samantha Crawford and her mother (whose face you see in our office) worked hard over the summer to make bracelets that were sold at Halloween. The money from the sale of these bracelets, private contributions from parents during our Open House and the sale of popcorn, enabled us to sponsor little 8 year Mbithi Mutheu and his family for a year, fulfill his wish list and provide money for some Christmas presents. What a great success story in a short time! For more information please refer to www.creationofhope.com. Hi my name is Samantha, and my mom works at Fairview Public School. My mom told me about Creation of Hope. We thought about making gimp bracelets and keychains and selling them to the staff and students at Fairview Public School. All the money raised was donated to the Creation of Hope. So far I donated almost $400.00. I hope to raise more money for Creation of Hope. We have had so many individual donations over the past month. These have included generous donations from many of our sponsors including money to purchase a Christmas gift for their child but also for other deserving children and other purposes. Fred Dawber, again and again, makes significant donations. In addition to Christmas money for the four children his family sponsors, he provided dedicated money to purchase sports equipment for Kate Stadium (named after his daughter) and to help with the addition. 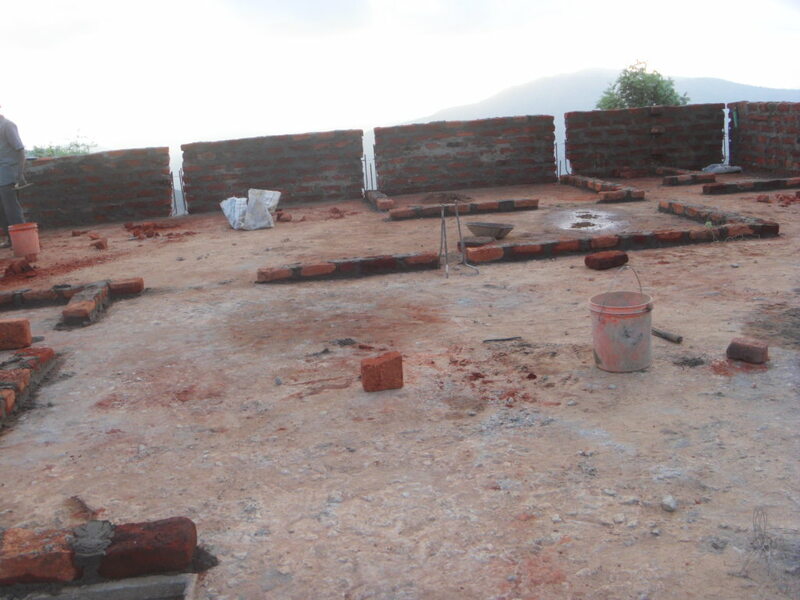 Marc Stevens also provided Christmas money for his sponsored child but also a sizeable donation to be used for ongoing construction needs for the new building. Sally Briggs was moved by the stories of the children of Kikima and also made a very generous donation that will significantly impact on the children of Rolling Hills. We had a number of wish lists granted during this period. Emily Dawber funded one – a present for her sister Kate. Knowing Kate the way we do I can’t imagine a more caring and compassionate present for somebody who is so caring and compassionate about the children of Kikima. In fact we had many wish lists granted this month. I’m always particularly pleased when members of the writing community step forward. Both Marina Cohen and Pamela Bullock have funded the granting of a wish list and Jordan Kerbel has made a donation to provide for children. Syd and Faith Page provided a donation in memory of Syd’s mother Audrey to be put toward the completion of the expansion dedicated to his sister, Diana’s Wing. Sincerely thanks for your support. In the pictures below you can see the addition rising up. Julia with assistance from Megan and the members of her residence have been operating a ‘Cans for Kenya’ fund raiser at Guelph. So far they have raised $501.00. In addition to raising funds they have also been raising awareness. 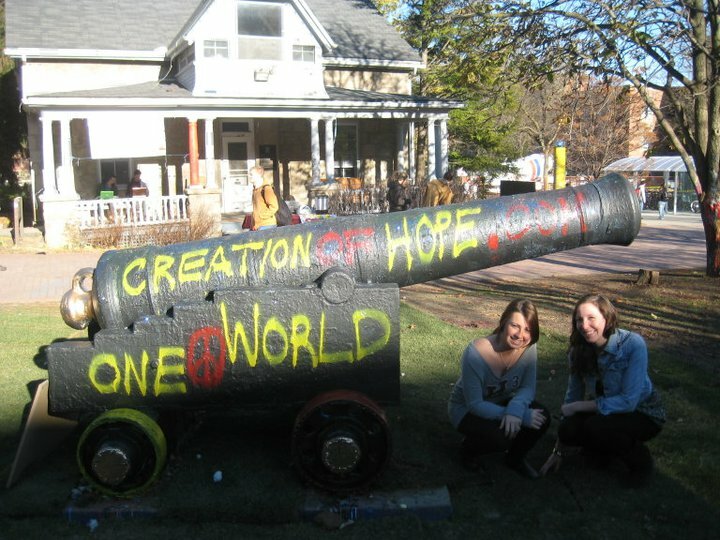 There is a tradition at the University of Guelph that students spend the entire night ‘staking out’ the cannon and then painting it. Below are some of the pictures of that night and the results. Sometimes when I speak about the project there are young people who are inspired to help elsewhere. Here’s the story of one of those children. Brendan Baginski is a grade 7 student at Lisgar Middle school in Mississauga. I was there speaking to the school as part of a kick-off campaign that will see them raising funds and establishing Skype conversations with our children in Kikima. Below is a copy of the article that appeared in the Mississauga Booster which outlines the outstanding efforts Brendan has undertaken to help create a better world. Congratulations Brendan! Lisgar Middle School Grade 7 student Brendan Baginski is proving that when your truly passionate about something there’s nothing you can’t achieve. 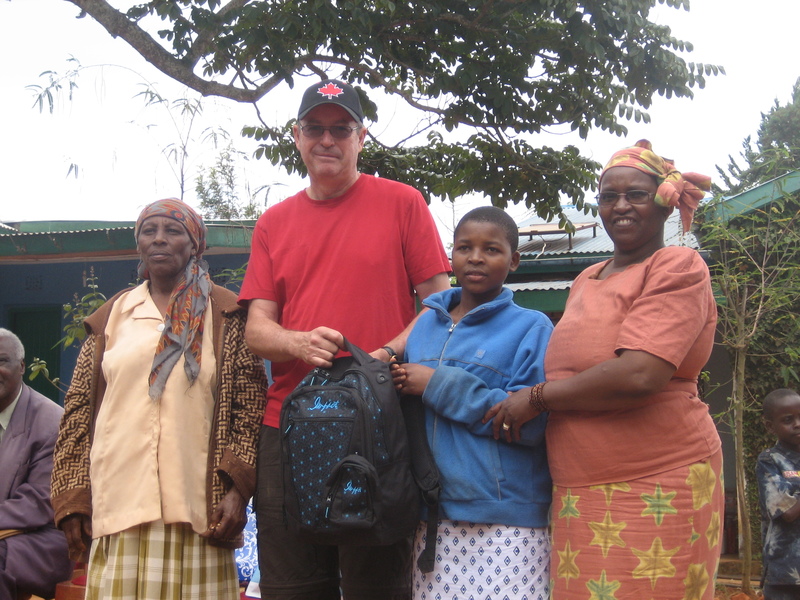 After hearing tales of families in Kenya during a presentation at his school in September, specifically how one man, Erin Mills author Eric Walters, was doing his part to help those living in poverty, Baginski said he was inspired to do whatever he could to improve the lives of people in Africa. “Eric Walters talked about how he went to Kenya, helped build schools and helped send kids to school,” said Baginski, 12. He said Walter’s stories about Africa really opened his eyes. Hoping to surprise his parents on Thanksgiving Day, Baginski set off to raise $100 to donate to those in need in Africa. He contributed some of his own money to start himself off and then asked his aunts, uncles, grandparents and other family members to contribute to the cause. He also opened a small store in his bedroom, selling pencils, erasers, elastics and candy to his family as well. By Thanksgiving Day, Baginski had more than $200. He prepared a speech and read it to his family, including his parents. His mother Jodi Baginski said that when her son stood up from the dinner table to share the plight of many African families, it moved them. She said although he’s only 12, he is like an “old soul. “He’s sensitive and sensitive to other people,” she said, adding that, in Grade 5, he formed an anti-bullying group. She helped Baginski with the decision to donate the money to the Canadian Baptist Ministry, which has a gift catalogue that details what you can buy to help families in Africa. He said he purchased four water filters to help four families, a pig, cow or goat to help one family feed themselves and three pairs of rabbits or chicks to help another three families from the $235 he raised. “I’m very proud of what I did because when I originally started, I only though I’d end up with $25,” said Baginski. On October 30th, we hosted a great fundraising event for The Creation of Hope. We were very happy with the results, learning that the funds raised would allow three students to attend high school and would provide a cow for Eric, the boy we have been sponsoring for about a year. Unfortunately, the happiness we felt was followed by some very sad news. Just a few weeks after the event, we learned that our friend, and the dj for the event, Andrew Curling, had passed away suddenly. In the program for his funeral service, his family and friends made it clear that he was a man with many positive qualities. They described him as a “philosopher, thinker, doer, philanthropist, health buff, vegetarian, comedian, energy bunny, scholar, enthusiast, motivator, soul mate, adventurer, kindred spirit, saint, pursuer, achiever, perfectionist, artist, musician, teacher, encourager, historian, and father”. Clearly, he was someone who made a positive impact of the lives of those around him. 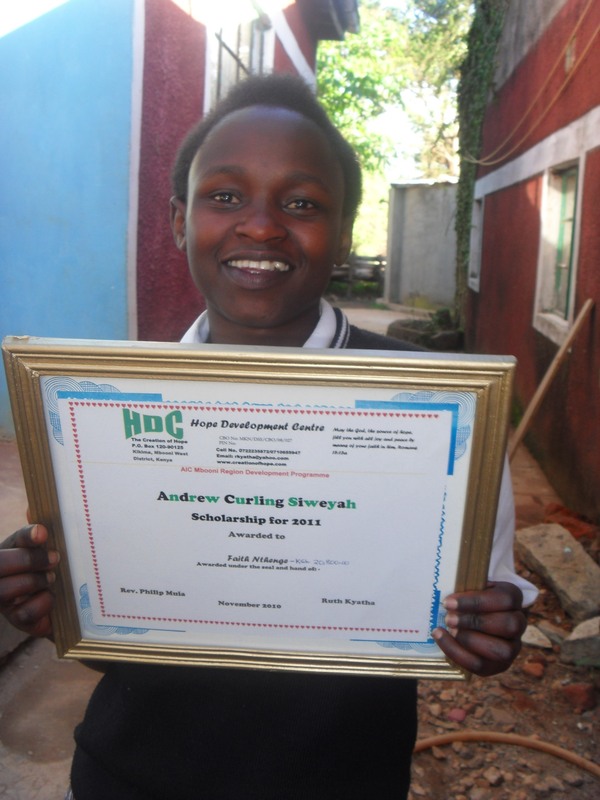 Andrew had also played a major part in making our fundraising event successful. So, a decision was made to honour him by creating the Andrew Curling Si-We-Yah Scholarship. All three students who received the scholarship wrote heartfelt letters to the Curling family expressing both their condolences and their thanks. We will continue to help friends and family honour Andrew’s memory by hosting an annual fundraising event in his name. Andrew Curling was a man who loved life. He was on a constant journeyfor knowledge and success. Andrew grew up loving music and used thatpassion to become a DJ. That part of his life brought him great joy. When Andrew was in his early 20’s he heard a story from a good friendabout a guy who stood up in a grade 12 history class and talked abouthow we were all Africans. This was the catalyst that began Andrew’sjourney to learn, live, and breathe Africa. Andrew read everything hecould get his hands on. He craved knowledge. Andrew later used this knowledge to start his own T-shirt company called Si-we-yah. His intentwas to create a culture of the “trendy T” with a message that had meaning.Andrew past away suddenly on November 8, 2010, not able to see all ofhis dreams fulfilled. 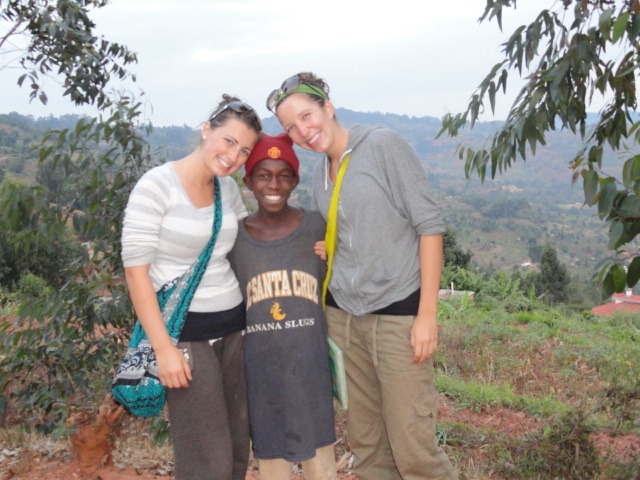 It is an honour to have the Si-we-yah name working tosend students to high school in Kenya. He would have considered this hisgreatest achievement. We have made a commitment to pay for the high school fees of 11 children who are either in our residence, in our outreach program, or have been specifically identified as worthy children needing assistance. Some of these students are returning to high school while others have just finished writing their national exams which determine what type and level of school they can attend. These results will not be known until early January and for those children we do not know the exact fees which range from around $150.00 to up to just more than $500 if they attend a Provincial School. 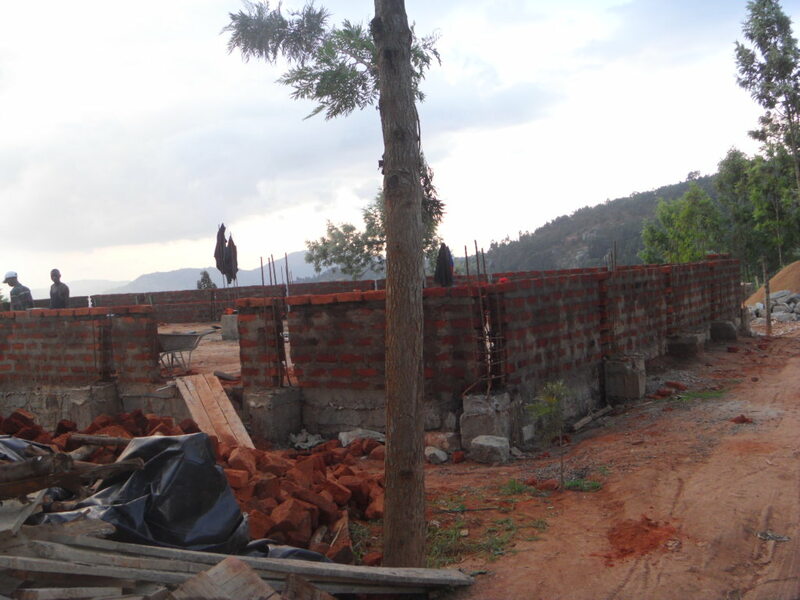 The funding for four children, Mutuku, William, Faith, and Sarah has been noted. Money raised by Cans For Kenya is being used to pay for the high school fees for Ndana and Mary. The cost for the two children is $490.00 for the year for all aspects of their school. Ndana is the older sister of Muthama. She and her brother reside with their elderly, blind great-grandfather, and while he is the guardian, they are the care-givers. Both are amazing young people and it is actually our honour to help such amazing children along their life journey. Mary has been one of the ‘head girls’ at our residence as well as the ‘head girl’ at the elementary school where most of our children reside. She is unfailingly polite, hardworking, and caring. 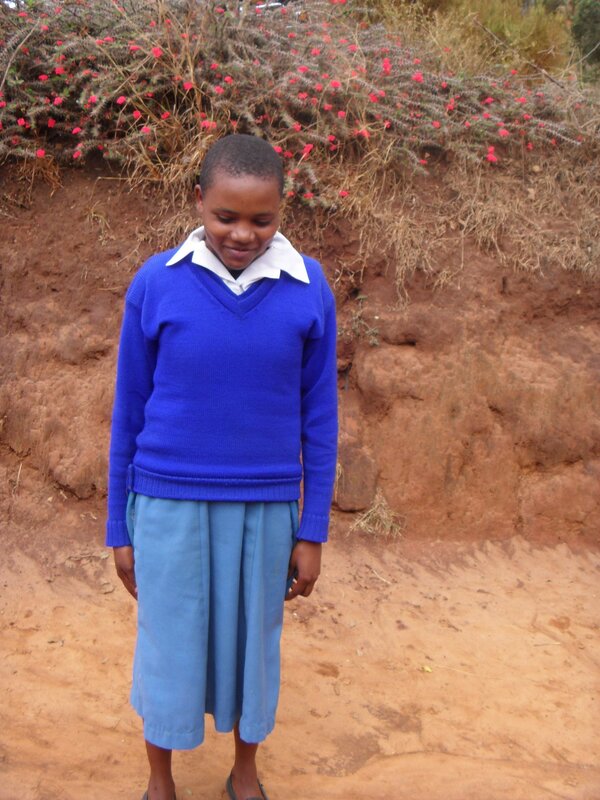 It is wonderful that through the efforts of Cans for Kenya that she will be going to high school next year. 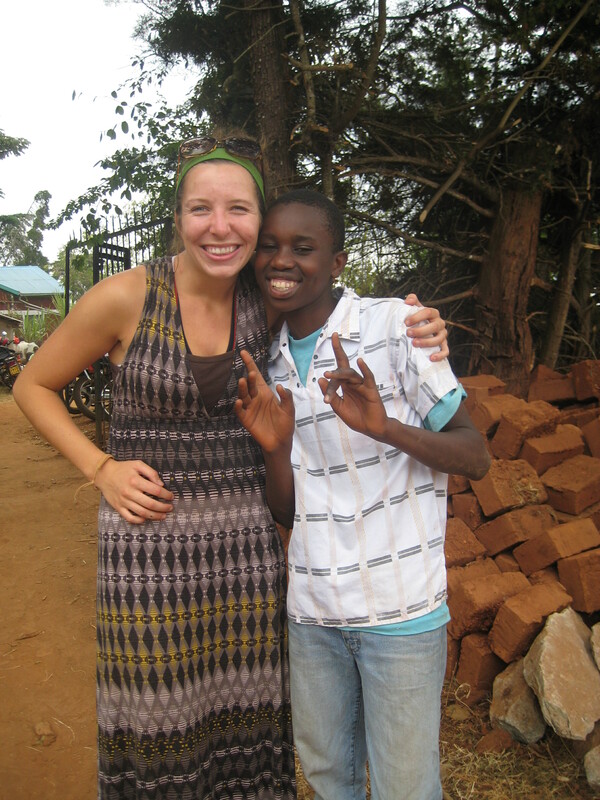 Originally one of the students we were going to be providing with a high school education was Benjamin. This commitment was made last summer when we visited with him. I know that Benjamin is very special to both Julia and Megan. They were moved by his situation and inspired by his spirit. 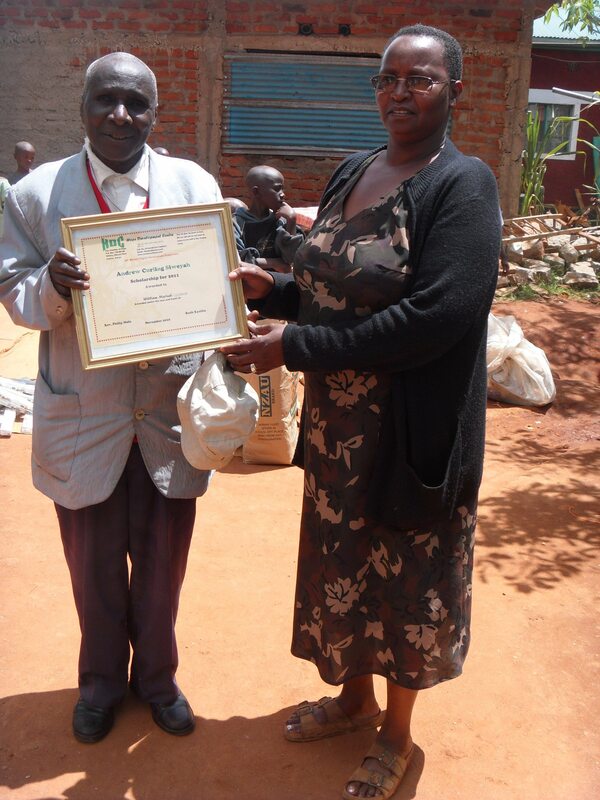 In addition they sponsor his cousin, Baraka, who resides at Exodus Children’s Centre operated by Elijah. It is an inspiration to me that these two young ladies have made this ongoing commitment to Baraka and have changed his life. However, Benjamin was so happy that his high school education will be supported that he made a decision not pursue high school next year as he wants to improve his marks and therefore try to qualify for a better high school. This is Benjamin’s statement that because we believe in him and are going to give him the chance to pursue a better life he’s prepared to work even harder to get there. A cow for Eric. Part of the money raised at the Halloween party was used to purchase a cow for Eric. Thank you Kelly and Chris for your ongoing support of your sponsored child. 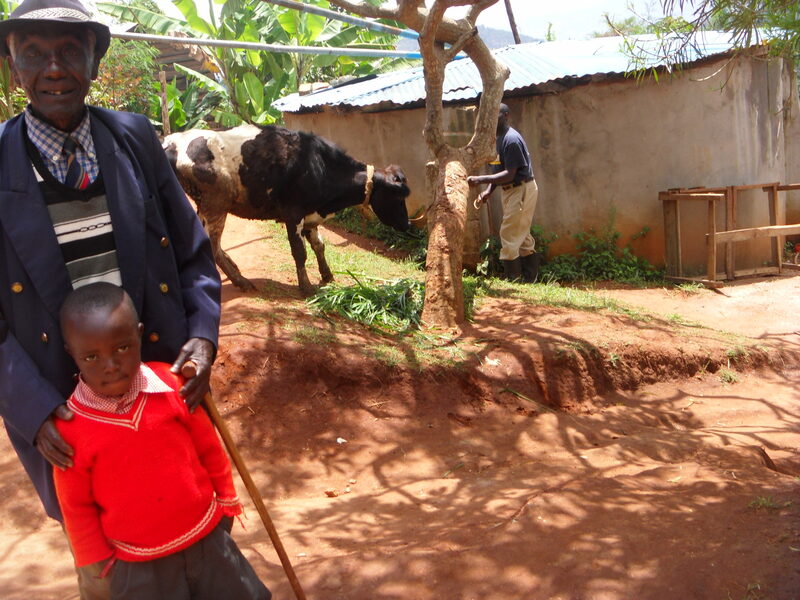 Eric, his great-grandfather and their new cow! Money donated by St. Benedict in Sudbury paid for the salary of our Matron for November, $108.00 as well as for fuel for the generator to run the ongoing construction and living arrangements for the month $27.99. The remaining fuel cost of $6.01 was provided from funds from Vaughan Willard P.S. in Pickering. In addition Vaughan Willard funds were used to provide all end of the school year costs, $251.00 for the entire children’s residence. These fees included small parent/child fees as well as exams and books. The money donated by the START conference in Brampton was used as follows; $46.00 for the salary of the night watchman – the soldier who protects our children. $62.00 was used for care and feed for the goats. $220 was used for additional food and transportation costs for the monthly food distribution to the community. In addition another $95.00 was used for fuel costs to allow our program staff to move throughout the region providing services. The remaining $77.00 was part of the cost of ballast used in ongoing construction. Funds from Sir Winston Churchill P.S. in Neapean were used in the following way. $44.00 toward the final costs of bringing in electricity to the residence, $25.00 for firewood (which cooks all the meals for all the children), $63.00 for seed and seedlings for the land dedicated to providing food for the residents, $80.00 for the tutor who helps the children every day after school, $8.00 for the barber for children needing to be groomed, and $196.00 for water purchases. We had hoped to see the last of water purchases when we finished our well but the delays in getting electricity mean we haven’t been able to get water from own well in sufficient quantities as yet. In addition we used $151.00 of that school’s donated money for posts for the new building and the remaining $92.79 for timbers. Unseen beneath this top level, descending down the hill is first the girls’ residence and then the lower level is the boys’ residence. This has been a major undertaking and we continue to work as funds become available. 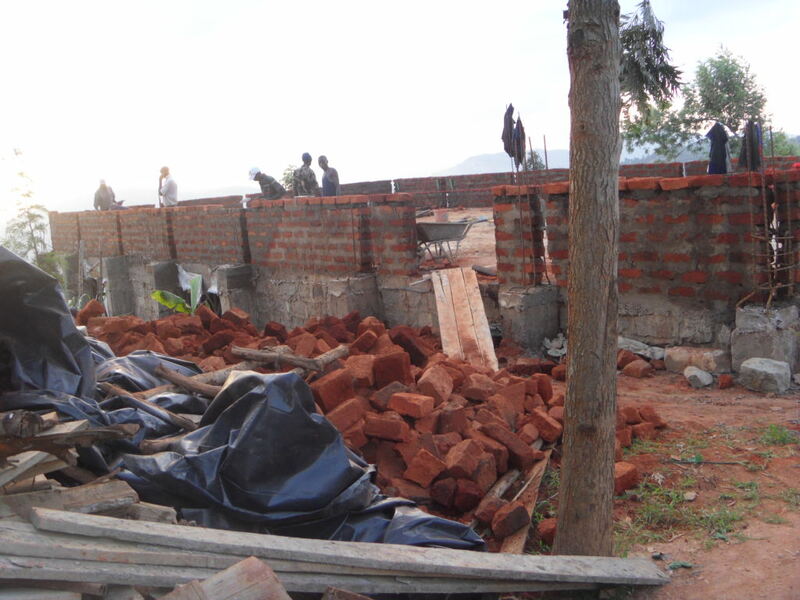 We have now used all of our funds, but work will continue. Here is a further breakdown of how funds raised by different schools were used. 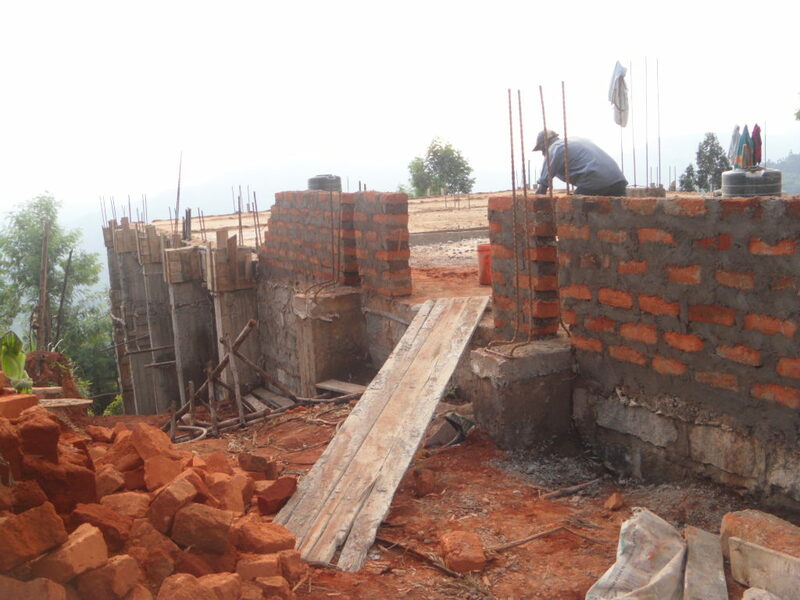 $384.00 raised by Highland was spent on reinforcement bars. In addition the remaining $216.23 of the money raised by Highland was spent on cement. $100.00 raised by Rolling Hills students Sarah and Mariah and $552.20 raised by Darby and Ehren was all used for construction costs, purchasing plumbing supplies, $34.00, electrical supplies $342.00 and the remaining $276.00 going toward cement. $780.00 raised by Fairview is being used to pay for the yearly sponsorship of a child – see Kay’s updates for more about this. The remaining $462.94 is being used to provide a wish list and Christmas presents for children who would not receive anything. Often these items will be clothing, school supplies, household items like a lamp, but also for small toys, games or sports equipment. Thanks to all of you. It has been another amazing month!